Everything you need about mini drones. Drone technology is one of the top trends that define this decade. They are revolutionary and one of the most sought-after technologies of this generation. During their introduction to the masses, drones are regarded as a toy made for geeky hobbyists. However, drones have evolved into a technology that we can use in our daily lives. Today, it is easy to learn how to fly a drone. Before you can tackle a more sophisticated and larger drone, you can familiarize yourself with a mini-drone. Since, there are many drone models available that we can choose from, choosing the right one is always hard. It is quite challenging most especially if you do not know how to select the best mini-drone. Contrary to what you might think, not all drones are the same. Although all of them share a commonality in terms of the major parts like gyroscope and propellers and of course, the controller. These parts have a universal function among the drones. What makes drones different are on the design spectrum and the extra features that are available with each mini drone. Why Should I Buy a Mini Drone? Before we proceed to discuss the options for the best mini drone, let us get to know this most coveted piece of technology. To establish what a mini drone is, let us define them on the frame size perspective. The standard way to measure them is through the distance from the opposite corners of the motors. Compared to Nano drones that can fit in your hand, a mini drone is similar to the size of your hand. In the drone family, the mini drone is the smallest next to the Nano drone. We have mentioned earlier that it is a favorite for first-time drone pilots because they are great for both indoors and outdoors. They are also affordable and resilient to crashes. Beginner drone pilots can use them as an ideal starting point. It may lack the features of a quadcopter but if you are a hobbyist, flying it is as fun as the real deal. Buying a piece of technology is an investment, and the first reason why you should choose a mini drone is due to its reasonable price. The professional drones available on the market today can cost hundreds if not thousands of dollars. However, these mini drones are affordable for an average consumer. If what you are looking for is fun, then this is the right choose. It is easy to operate too. Since these mini drones are smaller and more compact than the professional alternatives, it is a perfect choice. Our generation is big on portability, we want our things to be mobile, and so this drone passed the requirements. They are miniature in size and lightweight. Therefore, it does not require registration with government agencies. Many people have veered away from flying heavier drones because of registration requirement in most countries. The drop in the demand for consumer drones can be attributed to this reason. Nevertheless, for those still interested in drone flying, these little drones are perfect because they do not require registration. 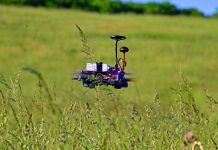 It can also provide the chance for drone enthusiasts to pilot a drone without all the trouble. Another good thing about mini drones is their fast charging time and longer flight times. This is the reason why many people are interested in buying them. One example is a mini drone that has a Li-Po battery that has a capacity of 53 mAh with 3.7V voltage. This battery can let you fly the UAV for about 6 minutes and recharge the battery. Charging is only via a USB cable, which takes about an hour before you can fly the mini drone again. When we say mini drones are little things, we mean it. All mini drones have LED lights that are placed around their bodies. This helps the drone pilot see them easily when flying at night. The drones have intricate designs too which together with the LED, are a remarkable sight when flying during daytime and nighttime. There are many things to consider before buying yourself a mini drone. These features are critical and because it is vital to know the flight time and the range of its flight which in turn depends on the weight and size. The distance of the remote control, on the other hand, depends upon the controller’s features. Mini drones may be small, but they have many fun and exciting features both outside and inside. Its compact size and the handy controller makes it easy to take anywhere. This small feature is also an advantage because it is less destructive when it crashes. Most of the mini drones share common features. The power that enables it to fly is through a rechargeable battery. You can charge them with a USB cable. The average flying time of mini drones is between 6 to 9 minutes. The channel controller has a range of 2.4GHz. Another common feature is the internal gyroscopes that improve its stability during flight. It also enables the mini drone to fly in two options, the high flight, and the low flight models. It has propeller guards too to fly indoors. This is a self-evaluation for the pilot. Before buying a mini drone, you need to know what your skills are in flying a drone. This will help you navigate your drone, and in case of collisions or crash, the damage is minimal and less costly. If you are a beginner, you had better start with less expensive mini drones to train. When you have earned your wings, then you can go for a far more sophisticated version. Flight time pertains to the amount of time it can fly or stay in the air after launching. There are many factors that may affect flight time. We have the weight, the size of the battery and even the flying style. 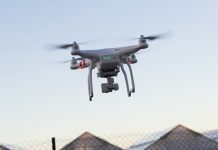 Typically, a drone with a higher price tag can fly up to 20 minutes after its takeoff while the cheaper drones can last in the air for about 7 to ten minutes. The GPS sensors allow you to set specific coordinates on your drone. Once you have set its coordinate, the drone can fly into the location with just one touch of a button. This feature is found mostly in high-end drones. The GPS sensors are very helpful in navigation. You cannot find this feature in mini drone but with everything can be minimized now; the future of GPS on mini drones is not far-fetched. 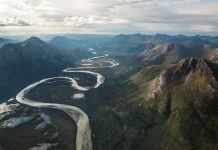 If you are using the drone in photography, it is better to have a drone with good picture quality. If you have budget constraints, a cheaper quadcopter can give a decent photo. Another feature that is not available yet in cheaper drones is the First Person Viewing (FPV). This controller pilot the mini quadcopter. Most of the controllers have a range of 2.4GHz, and it has two analog sticks to control the mini drone. These controllers have many different capabilities depending on how much you are willing to spend on your drone. Some controllers have LCD monitors while others don’t have. The built-in LCD monitor is a good feature because it enhances the pilot’s experience. This is the bestselling model from Holy Stone in this price range. 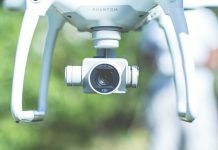 While its price may definitely convince buyers to try it, there are also other interesting factors make this piece worthy of the adoration of drone enthusiasts. When you purchase this mini drone, you will have two included batteries. This is good news because you can easily replace the empty battery with a full one and continue flying. The design of Holy Stone F181 is nothing extraordinary for a mini quadcopter. It is not beautiful, but it still looks good and does not look like a cheap toy. What it lacks in the looks department, it is compensated with durability. It has a good built with LED lights at the bottom, common in the new drones that are coming out. The lights also change from blue to red, for forwarding and backward motion respectively. This feature is actually helpful when flying the mini drone at night with an additional light on its ‘nose’; it can help the pilot determine the position while flying. Holy Stone F181 is equipped with a 2MP camera that can record videos at 30 frames per second and take photos at 720P resolution. It might not be a professional camera, but still, it can be useful. You can use this camera for taking personal, fun photos. These photos and videos are stored in a 2GB SD card included in the package. If this memory is not enough, you can expand it with up to 16GB SD card. The controller is like your gaming console controller, very comfortable to hold especially if you are familiar with the joysticks. It requires four AA batteries, which are not included in the package. There is a little display screen on the controller. Be warned though, this does not display real-time photos or videos, but instead, it shows you some crucial information like the status of the battery, the strength of the signal, drone speed and the status of the LED lights. In terms of its flight performance, it has different speed selection. Of course, if you have experience in flying drones you can go to the high speed immediately. This mini drone is good for flying outdoor, but you need to be careful because it has little wind resistance. It is a stable flyer for both day and night flying. As mentioned earlier in the article, the flying time of most drones in this category is around 6-7 minutes at a controlling distance of 100 meters. However, you can a better flying time with this mini drone at 7-9 minutes, the range of the controller should be 50 to 100 meters though. If you want a mini drone that fits in the palm of your hand and can safely fly, then this HOLY STONE HS190 Foldable Mini Nano RC Drone is the right choice for you and your kid. Yes, you heard it right; this Nano drone is safe for your kids to fly. Its endearing feature is its foldable design. This mini quadcopter is easy to carry and can be folded into the controller. You can carry it around and anywhere because it is also lightweight. Its impressive LED lighting system can help you check its location and provides clear visibility to control the drone effectively while in the air. You can charge this drone in two ways, the USB cable to charge the batteries or through the built-in cable in the controller. The latter provides convenience when you carry your Nano drone around. The strength of this drone is on its flight. It has three speeds to choose from to accommodate both the beginner and the expert flyer. While in flight, its altitude hold function releases the throttle stick. This action allows the drone to hover at this current height no matter where the location is. In addition, it has an interesting feature, which is a high-speed rotation. It is capable of doing 360 degrees’ circle and flies at high speed. It is an exciting feature to practice your flying skills. If that is not enough, you can also do 3D flips with this drone for an awesome show. In addition, this drone can also go in different directions: forward and backward, left and right. The headless mode feature allows you to orient the drone to your own exact viewpoint. Your kid will have an awesome time flying this device. It also has one key button or one key return for an easy takeoff and landing. You cannot find this in any regular mini drones that are quite boring and disappointing with only limited flying capability. All you need is one button to press for takeoff and then press it again for a smooth landing without crashing. This extends its life a little longer especially if a kid will be playing with it. This Nano drone has a flying time of 5 to 7 minutes within the controlling range of 30 to 50 meters. The charging time can take about 40 minutes. Just to clarify, this drone has no camera. Drones are quite an investment. 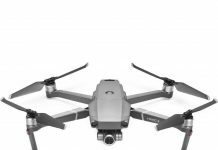 Yes, there are drones that are priced lesser than the rest, but they don’t come up to the standards of what drones from a company like DJI can. If you want something that has a decent flight time and plenty of features, then you need to spend some cash on a decent mini drone. Tello is the new drone from DJI under $100. Well, it is actually not 100% owned by DJI but a partnership with Ryze. It is a combination of the technical expertise of the top drone company and the rising talents of Ryze. One of the features that stand out with this mini drone it is easy to fly. 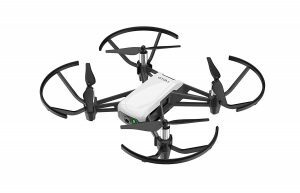 For first timers, it is quite safe to fly Tello, and a beginner can easily pilot this. Experience flyers, on the other hand, will have lots of fun flying this thing. If you look at the design of Tello, it looks like another DJI drone, Spark. This mini drone has a flight time of about 13 minutes, which is longer compared to the standard 5 to 7 minutes of the regular drones. It runs on a Lithium Polymer battery, which is included on the package. It is loaded with a 5MP camera that has a field of view of 82.6 degrees. 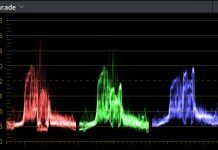 This produces a video of 720P at the rate of 30 frames per second. 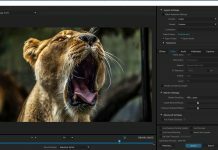 For a crisp and clear picture quality, it has an added feature called electronic image stabilization (EIS) for improved footage and less blur. It runs on a 14-core processor to ensure that you have excellent footage. For better picture taking, the Tello has EZ Shot that makes shooting easier and fun. You can choose from Up& Away, Circle or 360 modes. This drone can feed the video directly to a tablet, phone and even into a VR headset through FPV real-time transmission. It also has a headless mode, which means that your drone is running in the same direction of the remote controller. The One Key 3D Roll feature of this mini drone has the latest technology that is 6-Axis Gyro flying control system. This means that it can take stable pictures even when the drone is flying at high speed and finish the 3D roll with just one key that is easy to use. This mini drone is made for taking aerial videos and photos, the DBPOWER MJX X400W FPV Drone. It has a dedicated app that can deliver a 3D video and view them on VR headset. In addition, it has a high definition camera giving you a bird’s eye view to take control of the photos and videos it can deliver in real time. You can share them instantly in your social media accounts for the world to see. 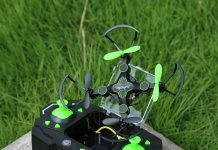 The DBPOWER MJX X400W FPV Drone has a 6-axis gyro technology that allows the mini drone to recover quickly when moving in any direction the pilot wants it to. Even if you change direction aggressively, you can still have a stable flight. It also has a headless mode appropriate for beginners, leaving your worries of controlling of losing the drone out. With the headless mode, you can don’t need to tell the orientation of the drone because it is always in parallel with your remote control. 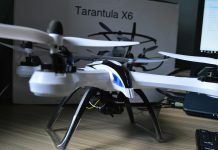 It has a 6-axis gyro technology the makes it capable of flying aggressively and quick response to changing of direction. With this technology, you can do the spin roll and fly in any way you want. The 360 degrees’ spin is a sight to see at just a flick of the button. The posture control keeps the drone balance while flying. It also has a switchable two modes speed that you can choose from whether you are a beginner or an expert. You can practice on this mini drone to advance your level, and you can use the drone in both indoors and outdoors. This drone is designed with a good LED lighting system under it, which is helpful in identifying the front and back orientation of the drone. The light makes it easy to keep track of the drone while flying. You can turn the lights on the drone on and off with the switch button available. The blade guards on the drone protect it from crashes and knocks, and there are spare blades provided too. The controller is the standard design that looks like a console joystick. This drone’s propellers are made of individual motors. If you have damaged one of these, you can have them replace with the available spare plug-in interface motors. 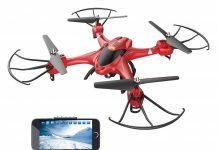 This drone is a perfect gift for children because the price point is not that expensive and it is easy to operate. Considering that it is in the lower price bracket, its features and quality are surprisingly good. It is also perfect for beginners because it flies in three different modes and there is a replacement blade available in case you lose or break them from intensive flying. The colorful LED lights provide beauty to the drone; however, it has an important function especially when you are flying it at night. Each of these replacement blades has their own orientation, so make sure that they are properly replaced. 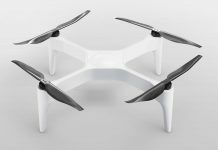 One of the best characteristics of this drone is its flexibility in landing feet that provides a cushioning effect when the drone makes an accidental landing. It also has curved propeller guards to soften the impact when it crashed into the wall or ceiling. All these features contribute to the toughness of this small drone. 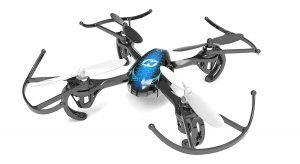 The HOLY STONE HS170 Predator Mini RC Helicopter Drone has a removable battery, which is easy to recharge for about 30 minutes giving you about 8 minutes of flying time. You can buy an extra battery to have continuous flying while the other battery is charging. The controller has a slightly awkward shape, but it is easy to navigate and has the headless mode that can be activated by pushing and holding the button. The headless mode is an important feature especially for beginners because it allows the pilot to control the navigation with ease. The only drawback here is the annoying sound when the headless mode is active. You can use many functions in the controller like turning the lights on and off and the different flying modes of the drone. The three-speed settings have an effect on the yaw rate in each of level and in flying the drone. 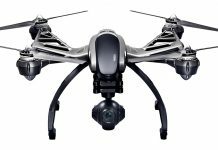 You will have plenty of fun using this drone because it is very responsive and can withstand the crashes. The gyroscope also works perfectly here, providing stability while in high speed. It has a 2.4GHz technologically adopted providing anti-interference and has good wind-resistance. You can control this mini drone at a distance of about 30-50 meters. This is another good option for a mini drone. 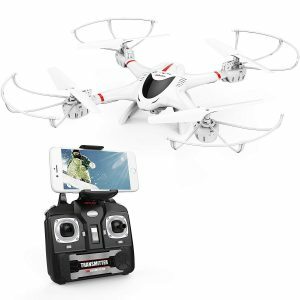 It is affordable but loaded with exciting features that make this quadcopter one of the best. 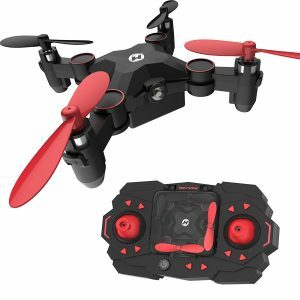 SGOTA RC Drone is a favorite among the beginners because it is durable and comes with propeller guards that are almost the same as those found on gaming consoles. What makes it interesting is the beautifully designed body. The remote control looks like a joystick with a small screen, and the whole drone folds easily to carry the drone everywhere. Sgota RC Drone can be operated with a flight path. When you are in the phone control mode, you can draw the flight plan on the screen, and the drone will fly according to the specified course. There is also a headless mode and one key automatic return feature. This means that you can fly the drone at any angle in the direction you make in the remote control. There is no need to identify the front and back of the drone to make forward and backward motion. Another great feature the One Key automatic return when the drone is flying at a longer distance. You just have to press the return button, and the drone will come back instantly. There different flying modes and actions that this drone can do. It can flip 360 degrees, track flight and has a gravity-sensing mode. You can choose from the three-speed settings depending on your skill level. 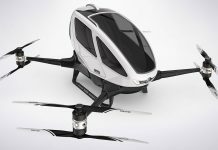 It also has 6-axis gyroscope, a controlling distance of about 50 meters and the battery can work from five to eight minutes. The FPV function allows you to connect your phone to the drone. With this feature, you can download an app to display the view directly on your phone. It provides the users an enjoyable view. You can put your phone in a VR for ultimate enjoyment. You can have a perfect picture or video with this drone. It has a 2MP camera that gives you a 720P HD camera. The scope of vision is about 120 degrees, wider than other drones in the similar price point. It has a powerful altitude hold function that allows you to release the throttle stick. Upon its release, the drone will hover at its current height with ease. From here, you can take stable pictures and videos. 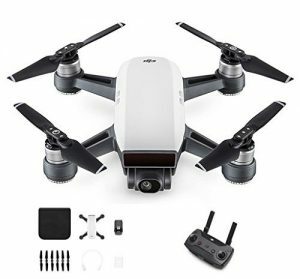 Another mini drone from DJI that made a list is the DJI Spark, which is quite popular among many drone enthusiasts. What is astonishing when you buy this drone is that it does not come with remote control. You can purchase them separately, meaning it is optional. The pack only includes an extra battery, a carry bag, extra propellers and the propeller guards. The reason you might not initially need the remote control is that DJI Spark can be controlled remotely with the use of hand gestures. Another option is you can download an app on your phone to control the drone and make use of the Quick Shot feature that this drone has. Like any drone controlled by an app, there are two drawbacks. First, is the limitation of the Wi-Fi range, which means that you can fly the drone to a maximum of 100 meters’ distance from you and as high as 50 meters only. There might also be low-quality video feed because of the Wi-Fi range. Another drawback is flying using a phone app is it is not as precise as controlling it using the real controller. Buying the Spark Remote Controller will make a big difference in flying this drone. It will increase the range to two kilometers and gives you a Sports mode that can give a live video transmission from up to 2000m limit. Using a real remote control will bring out the maximum potential that this drone is designed for. The battery has the common four-LED indicators, and it can last up to two good hours, the flying time of Spark is about 15 minutes. The Spark can take 12 MP photos, which may not be the best quality but perfect enough for sharing. 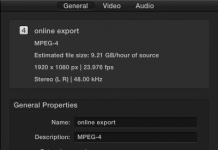 The video is at its highest quality at 1080p at the rate of 30 frames per second giving you stable footage. 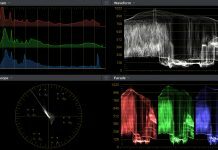 Smooth Vision stabilizes the third axis where the images are corrected by software so what will come out is a good video. The camera has a fixed focus feature; you do not have to remember to tap the screen to focus before taking a photo. Drone is an unmanned aerial vehicle (UAV) that can travel from one place to another. The distance it can travel varies depending on its range and other capabilities. It can perform different activities like taking photos and videos, delivering packages and even serving food in a restaurant. Drones can be controlled using a remote control, your hand or a software application depending on its purpose. What are the uses of drones? Consumer drones are mostly for fun. Most of the drones are used in photography, building inspections, journalism, and surveillance among others. Their popularity is mostly due to its ability to reach to locations that are difficult and impossible for humans to access without equipment. It is also cheaper to use drones in these operations. What is an average flight time of a mini drone? Advancements in drone technology are fast-paced. Most mini drones have an average flight time of 6-9 minutes depending on the brand and make. What will happen if the drone gets out of sight? When your drone went out of range due to unfavorable conditions, the drone will return to its starting position all thanks to the embedded GPS in its system. However, this recorded starting point can only be accessed if the drone has enough battery. Otherwise, it will land where it is when its batteries drain out, and the connection is lost. 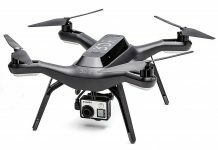 Are all drones need to be registered with FAA prior to flying? Each country has different registration guidelines for drones. The FAA has mandatory drone registration for devices that weigh above .55 pounds and up to 55 pounds. Luckily, for you, mini drones do not fall into these weight criteria. You can fly mini drones without FAA registration. 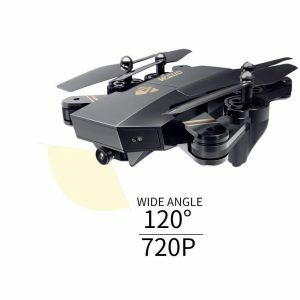 Are there accessories that I need to buy when I purchase a drone? There are many accessories that you can buy to enhance your drone. Every brand has their own set of accessories. 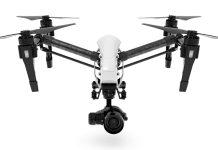 For example, a light polarizing filter that can enhance the video footage and produces stunning pictures are available for your drone camera. Extra batteries are necessary for uninterrupted flying. In case you break your propellers, you need to have extra with you all the time. To expand the memory of your drone camera, you need to buy a micro SD to record videos and photos. This stands for First Person View. This means that there are drones that allow you to control the drone via FPV. Instead of looking up in the sky while flying, you will fly the drone based on what you see in the live feed that is being filmed by the drone camera. There are many benefits in using FPV: you will get better orientation, smoother flying, easier to find good shots and you will have simulated flying experience. When you are shopping for a drone, you will be confronted by different acronyms. Make sure you understand these words because they are the key to finding the right drone for you. Words like RTF (Ready to Fly) means you just have to install the propeller or bind the controller before flying. BNF means bind-to-fly drones; you need to buy a controller or download software to fly the drone. FPV refers to First Person View wherein your drone will stream videos on your phone or tablet to give you a live feed as if you are riding the drone. FPV is very popular with drone racing enthusiasts, where they even utilize FPV goggles. LiPo refers to Lithium Polymer, a material that your battery is made from. More sophisticated drones also have different flight modes, usually to help the pilot capture videos or photographs more efficiently. For instance, many of the more expensive drones have a “follow me mode,” which automate the pilot controls so that the drone follows you. This depends on the country you are in, but in the US, you need to register unmanned aerial vehicles between .55 pounds to 55 pounds. Remember, this is the law, so if your kids are flying drones, make sure you help them register as well. A mobile device instead of using a remote control can control many drones. This is convenient, but you should check if your mobile device is compatible with the App. It usually works with the newest smartphones that are running in modern operating systems. Even if you are an expert drone flyer, you have to take into account the conditions before taking flight, as it will damage the drone. Clear days with minimal wind is ideal for drone flying. Remember that your mini drone is lightweight and you can lose control even with a small wind. Mini drones should not fly when the wind is higher than 10 miles an hour. Drones have lights, but it does not illuminate that position of potential hazards. They have no headlight only brake light. 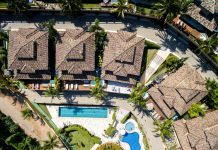 Although there is no rule for flying in residential and urban areas, the drone owner must use their drone with caution. Many people value their privacy and may complain when they see drones flying above them. You should stick to public open spaces like parks, fields, etc. Drones are one of the most sought after technology today. It is good to start joining the bandwagon with a mini drone. This is the perfect choice because, for a beginner, you need not worry about a few crashes and registration too. If you are not sure of what model or brand to buy, take into consideration your specific needs and what exactly are you going to do with your mini quad. 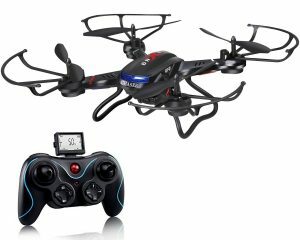 We highly recommend the HOLY STONE F181C RC Quadcopter Drone with HD Camera if you are a beginner because it has the latest technology, amazing features and at a very affordable price. It is also made from high-quality material and has a stable flight, which is excellent for taking photos and videos. These drones also have hovering ability and great flight performance. 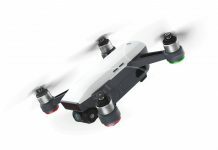 If you are looking to add drone flying to your list of hobbies or need one for photography, check out the list above and you may find the perfect mini drone for you!